Carnelian c.1780 English - in gold pendant mount. 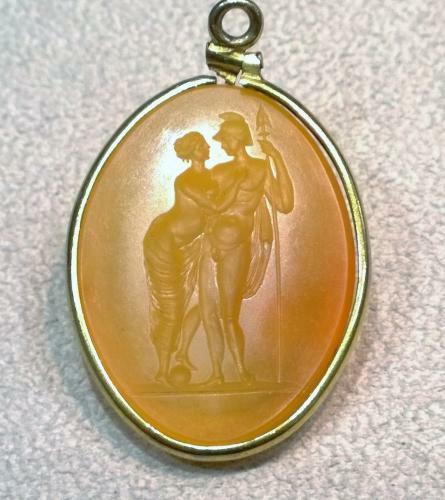 A really fine 18th century intaglio carved in pale carnelian, the subject is Mars and Venus, Venus is holding back Mars to try to stop him going to war. A very similar example is in James Tassie's catalogue of casts of gems, it is described as - 'Venus caring for Mars who wants to depart armed with a lance, conjuring ball at foot' William Brown is credited as the artist of the two versions. Our example is just as fine, though possibly not by Brown it is extremely well carved with excellent detail. Illustration below of a pair of casts from the Beasley Archive by William Brown and a single cast of our intaglio.